Watch Them or Hunt Them: What Do We Do with Wolves? Protected in some national parks, wolves can hunt, breed, and raise their families without fear of humans. Watching the daily activities of those park wolves brings joy to tens of thousands of visitors. But wolves can't see park boundary lines, and once they step outside they can become legal trophies for a few hunters or trappers. This conflict between watching or killing wolves occurs in Yellowstone National Park in Wyoming, Denali National Park and Preserve in Alaska, Algonquin Provincial Park in Ontario, Banff National Park in Alberta, and Kluane National Park in the Yukon Territory, according to Bridget Borg, in her recently published Ph.D. dissertation, "Effects of Harvest on Wolf Social Structure, Population Dynamics, and Viewing Opportunities in National Parks." Borg analyzed how the loss of a breeding wolf in Denali changes the stability and growth of the breeder's pack. She studied packs that had dissolved in Denali from 1986 to 2012. She found that breeder loss preceded the break up of 53 packs (three-quarters of those that had dissolved). She found that packs were more likely to dissolve if a female or both breeders were lost and pack size was small. In other words, taking out a breeder can kill an entire pack. Borg also analyzed how the hunting of wolves along the boundaries of Denali and Yellowstone altered wolf viewing opportunities within the park during peak tourist season. 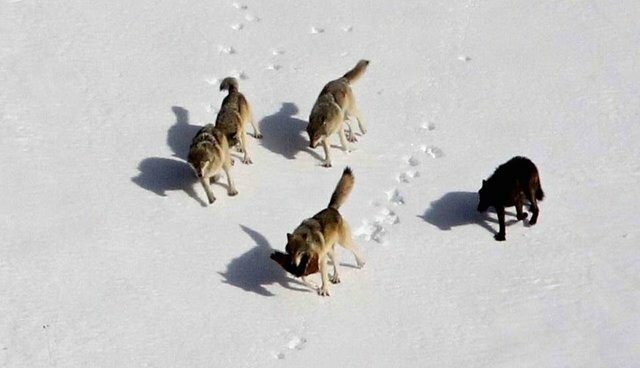 Sightings in Yellowstone fell by almost a third after years when a wolf was lost to hunters. In Denali, sightings fell by more than half. Her conclusion: hunting and trapping wolves adjacent to protected areas can reduce sightings despite having minimal impact on the size of protected wolf populations. So, there's the conflict: when a wolf leaves a park and a hunter takes a trophy, tens of thousands of park visitors are deprived of seeing a wolf in the wild. Is there a resolution? To Borg, closure of the buffer zone around Denali would present "the optimal solution." The closure could have "a negative impact for a few with a positive outcome for many," because over 400,000 people visit Denali National Park and Preserve annually, while no more than three trappers operate in the buffer zone in any given year. The National Park Service provided major funding for Borg's study. That's understandable since the NPS must "protect naturally functioning wildlife populations and wildlife viewing opportunities." Meanwhile, on state lands adjacent to Denali, the Alaska Department of Fish and Game must provide for hunting and trapping as well as wildlife viewing. The conflict over what to do with wolves is built into these government policies. Allowing hunting next to parks gives a few hunters the thrill of taking a trophy, while disappointing thousands of park visitors who come to see wolves. For me, the answer to the question of whether to watch or hunt is clear: the Montana Fish and Wildlife Commission should close the two hunting districts north of the park to hunting and trapping. This policy change would save the lives of four wolves each year. And if those saved wolves were breeders, their continued existence would avoid the likely disintegration of their families. Rick Lamplugh lives near the north gate of Yellowstone and is the author of the Amazon best seller In the Temple of Wolves: A Winter's Immersion in Wild Yellowstone. Available as eBook or paperback. Or as a signed copy from the author. Read my article, "You're Footing The Bill So Hunters Can Decide Which Animals Survive". Read my post about Jane Goodall's view of the impact of hunting on wolves in Alaska and Yellowstone. Read my post with excerpts from Marybeth Hollerman's powerful article about the impact of hunting on the delicate social structure of a wolf pack.